Yeah I have the ultimate 100 plan which is the 100/10. I have the tp-link tc-7610 which is listed on the compatible modems list for the plan I currently have. Although I am not against picking up a 16x4 modem if you think that could help I am willing to try. I will try and do some more research on relavent sites but I actually came here as a last resort as that is where I started. edit: Okay so I am going to go pickup a new modem and will probably be picking up the Arris Surfboard SB6190 it is a 32x8 modem so hopefully that will do the trick. If you have any personal suggestions on modems please let me know. I will post back on here after I get it setup and post the results. Okay so I picked up the Arris sb6190 and I upgraded to the 200/20 plan. I am still having the same issues. I ran a speedtest and I am getting 230 down and 5.81 up according to speedtest.net. Does this mean it is not anything on my end that is causing the issue? Something is definitely wrong with your up. 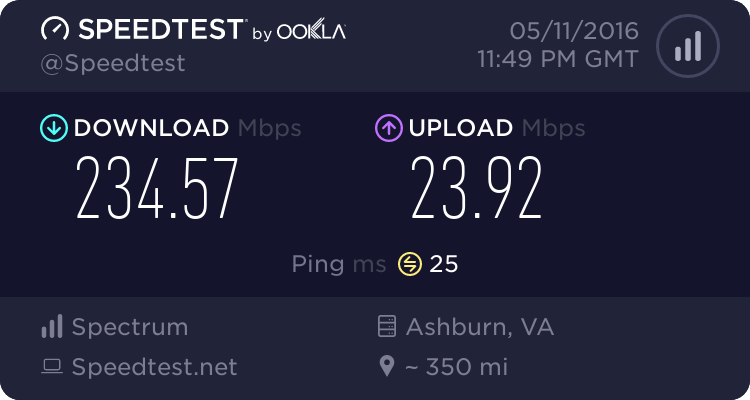 The up has been the most the most consistent on speed tests on any server I would choose on my 200/20 plan, and I've seen others say the same thing about how consistent their upstream speed is. My upload is better than that on non-maxx 30/5. So something is def up. Do you have QoS set anywhere? It sounds like a QoS issue. No I have not done anything to setup QoS, and I still have the same problems when I am plugged directly into the modem. Okay so I have no idea how but the upload speed problem has apparently resolved itself. I checked upload speeds before I left my house for a few hours and they were still the same, when I got back 3 hours later I come back to this.